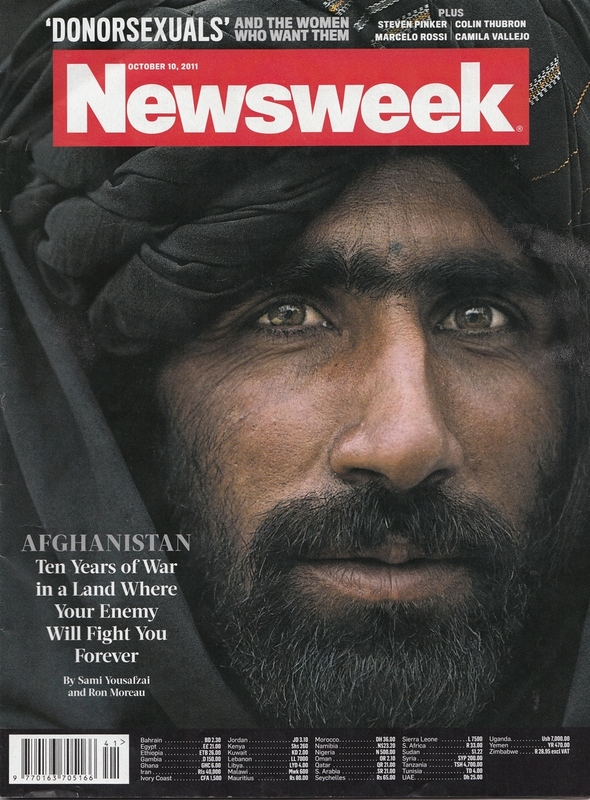 This cover article of this weeks edition of Newsweek is focusing on the 10th annivesary of the war on Afghanistan, and rather then encouraging finding solutions and bring people together, the article brings back stereotypes and confusion invoked during the Bush era, “You’re either with us or against us” (A quote that the Bush’s actually took from Beauty and the Beast, when Gaston wants to kill the Beast, and informs Belle of this us vs. them situation). But anyway back to the real world, I found it really surprising that all these negative dichotomies were invoked after a whole 10 years of war, proving that nobody learned any lessons about the horrible price of war. It is a scary prospect to consider that these stereotypical ideas of Afghani’s still exist, and that they can be applied again to any other situation where the U.S or any other major power wants to go to war. Hey Western World, read and repeat: THEY ARE YOUR ENEMY! THEY WILL FIGHT YOU FOREVER JUST BECAUSE YOU ARE SO ADVANCED! JUST LOOK AT ALL THAT PRIMITIVE FACIAL HAIR! I have chosen to analyze the cover article of the October 10, 2011 edition of Newsweek magazine. The cover page attracted my attention between all the other magazines on the news stand, due to the photograph of a dark, bearded man wearing a turban, with the headline, “Afghanistan: Ten Years of War in a Land Where Your Enemy Will Fight You Forever”. The headline itself has many connotations to the frame used in the article, and seems quite biased to the U.S perspective. The topic of the article begins with the premise that October 7th of this year marked the 10th anniversary of the war on Afghanistan. I will begin by exploring the article itself for themes and framing, then move into an analysis of the photographs that go with the article. Finally, I will attempt to give an alternative version for a headline and cover page covering the same story, to demonstrate how the frame could change. Before the article, there are two full pages that include a similar photograph to the photo of the Afghani man on the cover page. A caption in bold letters bigger than the headline carries the quote, “You have the watches, we have the time” (Moreau & Yousafzai, 2011, p.26). The reporters or editors made a conscious decision to include a quote which they claim is frequently attributed to a Taliban commander on top of the image of the unnamed man. This is not only misleading, making one think that the man in the picture is the man being interviewed, but also brings up one of the main thematic structures in the article, that of time. This theme is repeated throughout the article, as the basic premise is that the Afghan war has now been ongoing for 10 years. However, the article itself touches on several other themes, or frames that the writers find significant in the issue of the Afghanistan war; the first theme is time (relevant to the war that is still not over after 10 years), the second theme is U.S policy and official statements, the third theme looks at the link with Pakistan, and the fourth theme is that of youth. This statement is extremely presumptuous. There is no objectivity whatsoever, and comes from a frame with an extreme bias towards Afghanis. Not only does it claim that people from the region of Afghanistan have not progressed in the past century, it also proclaims them as primitive with no knowledge of time. It could also suggest that since they cannot feel time except in decades, that time in war means nothing to the Afghanis, and that another decade of war wouldn’t really hurt. The authors seem to find difficulty in explaining why the war has lasted for 10 years, and instead try to paint a picture of an irrational enemy, which makes it hard for the U.S to know when to withdraw. Next, the story is meant to give background or context into the war. One interesting point to be mentioned first is that there is no reason given in the article as to why the U.S government decided to attack Afghanistan in the first place, or even why the war continues until today. This lack of context serves some sort of purpose, as it is unusual for an article about the 10th anniversary of the war on Afghanistan not to mention the aim or objective on the part of the U.S. The war is kept in simple terms of the opposition and struggle of America versus the Taliban, without ever even bringing to mind the huge loss of civilian life. The reporters then move on to the theme of U.S policy, and include many statements made by U.S officials, starting from the highest position. Here, they discuss Obama’s set withdrawal date of 2014 (without mentioning the context of his sending more troops to Afghanistan at the beginning of his administration), as well as how Republic presidential candidates are discussing what they would do about this war (Moreau & Yousafzai, 2011). This part shows how all it takes is a decision from the president to stop the war at any time, but does not explain why it isn’t over yet. The article mentions that an important topic in the upcoming elections will be “America’s Afghanistan commitment” (Moreau & Yousafzai, 2011, p.29). The use of the word ‘commitment’ shows that the U.S government is indeed making a conscious decision to stay in the war. There is no representation in this article of civilians, neither Afghans nor Americans, nor is there any discussion of possible solutions, which helps set up these extreme oppositions of Taliban and U.S government- with nothing in between. Another important omission in context is the lack of mention of NATO being a big part of the war as well, perhaps due to the current controversy surrounding their entry and continuous airstrikes into Libya. This could bring to mind far too many different ideas, and perhaps the reporters want to keep the binary opposition, and thus the frame, as simple as possible. The U.S policy theme merges with that of the third theme, the link with Pakistan. Here, the reporters include statements by various U.S government officials and soldiers, which attempt to show Pakistan as a main factor that is allowing the Taliban to keep fighting, by providing ammunition and other various supplies ((Moreau & Yousafzai, 2011). This section is perhaps touching on what already seems to be a growing premise in U.S policy, the need to attack Pakistan. Air raids on Pakistan have been happening, the most memorable being the one that killed Osama Bin Laden last month. There is no question here on whether or not it is legal for the Americans to attack another sovereign state, whether it is even a good idea for America to enter another war, or on what the implications will be for Pakistan. Also, on statements made regarding Pakistan’s association to various terrorist attacks, they are only given enough space in writing to ‘deny’ the statement made against them, but not make their case. This is my mind, paints the picture of an opposition between the American soldier with a buzz cut and a young Afghan with [rebellious] long hair. Also, the Taliban are again referred to as primitive by their inability to gauge time; “if young fighters measure time, it’s only by the length of their hair” (Moreau & Yousafzai, 2011, p.31). They are creating an opposition between the images of the innocent U.S soldier, who is serving his country, and a Taliban fighter, who is nothing more than a brainwashed terrorist. When it comes to the photographs used for the article, they clearly illustrated a frame of the opposition between the U.S and the Taliban. The cover photo is a close-up of the face of a man who was not named or mentioned in the article, so I am not sure of the relevance of the photo to the article. The purpose of this placement however seems to imply that the person in the picture is the enemy the U.S is fighting. The picture can seem menacing, as the look in the man’s eyes is striking, his turban is clearly visible, the lighting is dark, and he has dark skin and facial hair; all traits which tie into the stereotype of what America’s terrorist enemy looks like. The picture is aimed at an American audience, as it is simple and is meant to stir up some kind of emotion. The headline here implies that this is the enemy that the U.S is fighting. On the two page spread at the beginning of the article (page 26), the same man is photographed in a different angle, with a wider shot showing a lighter background. The repetition of the same man in two photographs has a function; the second image has a lighter background, which is used perhaps to emphasize his dark clothing and the dark shadow on his face; darkness. In both pictures, he seems to be almost smiling, and looking straight into the eyes of the reader, which can provoke various emotions depending on the personal frame of the reader. For me, it was almost anger at the stereotype. For others, the emotion felt could be fear of the ‘other’ that is unknown to them. The image that comes with the first two pages of the text of the article is of an American soldier standing on the top of a base, with both the American and Afghani flag raised. This image is meant to show that the Americans are making progress, and have reached into Afghani lands and set their own flag next to the Afghanistan flag. However, it also seems to imply an endless stalemate, with the flags on the same level implying that no one is winning yet, and the open sky behind them perhaps implying an endless struggle. Next, the images on the third and fourth pages of the article are a series of opposing photographs, with captions that help illustrate the themes I have identified in the article. The 1st picture is of a young American soldier in uniform with the caption relating to U.S policy on Afghanistan, the 2nd picture is of an older, bearded, Afghani man in a turban, with a caption that states the belief that the Taliban might be running low on ammunition, the 3rd picture is of a young African American soldier who is not in uniform, with a caption questioning whether U.S soldiers will have to enter Pakistan, and the 4th image is of a young Afghani, with a caption quoting a Taliban official saying “Our young fighters are living an ideal life” (Moreau & Yousafzai, 2011, p.31). This series of photos is interesting as the subject of every picture is looking straight into the camera, which definitely intensifies the effect of the close up shot. This 4 photos show a juxtaposition of young Americans soldiers standing against the same backdrop, with an innocent yet sad look on their face, with the Afghans, on the other hand, standing outdoors, with a sinister smile forming on their face, and their eyebrows scrunched, and an intense look on their face. This frames one into seeing stereotypical opposing images, and allows readers to pass judgment over which faces belong to the ‘us’ category and which to the ‘them’ category. An alternative vision for the cover image and headline is very difficult to think of, as the both the image and headline are the prime fit for the biased article. However, if the cover image was switched to the one on page 28, of an American soldier on the roof of a base with both the American and Afghan flag on top of it, with a headline being “10 Years Since the Beginning of the War on Afghanistan: Some Progress Made” this would have generated different emotions. This image would have implied that the American soldiers still have more to fight in order to beat the Afghanis on their own territory. It would also imply that the war is getting nowhere, perhaps even by fault of the Americans. Rather, with the close-up of the dark man, and the headline invoking a never-ending enemy, the reader might fear the image of the enemy, and feel justification for the continuation of the war against a confusing, irrational, and different people who will fight forever. Rather than focusing on the binary oppositions between America and the Taliban and on abstract issues such time and the stirring up of the same terrorist stereotypes, there should be an article that facilitates the breaking of stereotypes, the establishment of unifying factors between all humans, and finding real solutions to the war. Civilians on both sides of the war should have been allowed to enter into the discussion, and not simply focus on any governments’ official rationalization of it. An ideal article should also stress the fact that this has been the longest war in the history of the U.S. One last point I would like to make is that I noticed after the recurring theme of the opposition between America having the watch while the Taliban has the time, is that out of the 8 total advertisements in this edition of Newsweek, 4 are ads for watches. The image on the back cover, in contrast to the front, is of Leonardo di Caprio posing for a watch advertisement. This is perhaps tying into the stories opposition of rational America vs. the irrational and dark Taliban. Moreau, R. & Yousafzai, S. (2011). 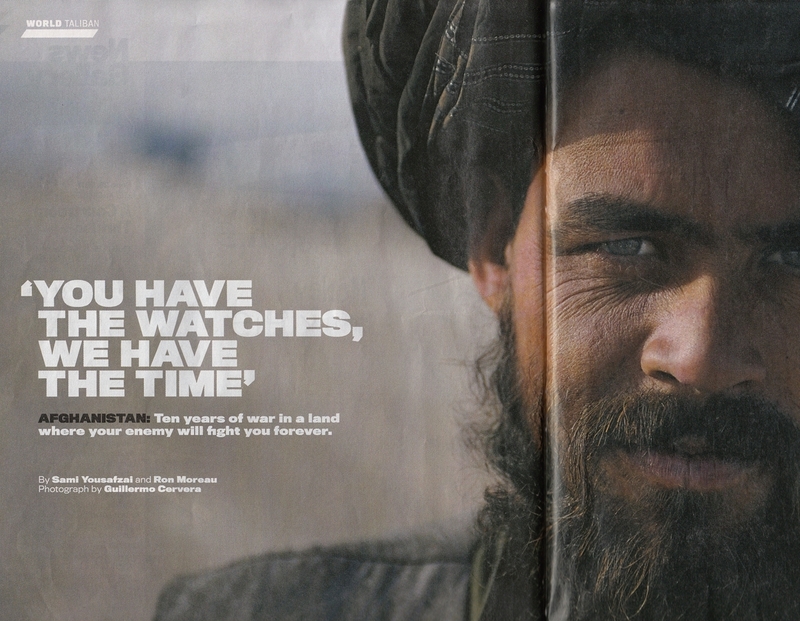 Afghanistan: Ten years of war in a land where your enemy will fight you forever. Newsweek, CLVIII (15), 26-31.